Berlin is a long way from Paris, and Frederick the Great did not allow French opera-ballets in his opera house. 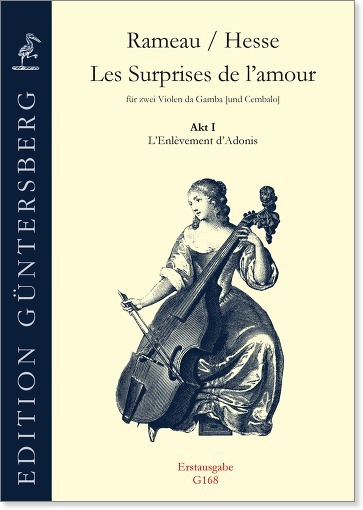 If you wanted to hear the latest and most fashionable items from Paris in eighteenth-century Berlin, you had to play it yourself. 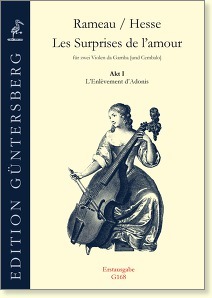 Thus the viola da gamba virtuoso Ludwig Christian Hesse created Hausmusik arrangements for two gambas of many such works, including Les Surprises de l'amour by Jean-Philippe Rameau, almost certainly for the instruction and entertainment of his student, the king’s nephew Prince Frederick William. Hesse has effectively condensed an entire orchestral score, with choir and soloists, into the duet format; while some parts may be missing, the original goût (taste or style) of the work is preserved with great flair. As Jonathan Dunford remarks in the Introduction, “the essence of the opera is preserved and miraculously falls naturally under the fingers, as if Rameau had conceived it as a viol duo in the first place!” Hesse and Frederick William were joined on occasion by other musicians, so we have included an optional harpsichord part to help recreate another likely texture at the prince’s soirées.